During the mid-game stages go to The Caribbean and participate in naval battles with enemy ships where you will be given huge amounts of EXP for shooting down the enemy fleet. It is advised that you consider doing this to get a level boost before facing the final parts of the game. The Princesses in each of the worlds are ALL pudding monsters that if you approach and press the Triangle button on your controller will enable you to play their special mini game which gives you the opportunity to receive various items such as Orichlacum and special abilities. In total there are 7 Orichalcum you can collect and doing so requires you to either find their location, complete specific challenges, or defeat a certain boss. Located in the End of the World in the Keyblade Graveyard. Located in the Caribbean World. It's on one of the isolated islands. One of the prizes of the Moofle Raffle. Get a high score in ALL 7 minigames of the 7 Princesses. The ultima Weapon is the most powerful keyblade Sora can yield. Once equipped Sora will gain the abiliity to Form Change to this Ultimate Form to enhance his combat capabilities to a further level. To unlock the Ultima Weapon you will need to collect the required materials and visit any of the Moogle Shops to create it. The ingredients you need to collect are 58 Synthetic Materia and 7 Orichalcum which can be gained by completing mini games or looting treasure chests. These are Keyblades that can only be obtained by preordering the game on specific consoles or stores. Exclusive keyblades each differ in appearance and abilities. This is the pre-order Xbox One exclusive keyblade which is able to direct destructive lightning attacks. This is the pre-order PS4 exclusive keyblade that imbues frost and snow to boost attacks. This is the Amazon exclusive pre-order for PS4 that is able to channel fire to charge it's attacks. Specific materials such as Flourite are needed to upgrade your keyblades, most of these materials are either dropped by enemies or found in treasure chests. Other materials that you require for upgrading your keyblades will become unlocked at the shop by progressing through the story. You will acquire the Shooting Star Keyblade after completing the 'Twilight Town' story. This keyblade transforms into a set of handguns that you can use to damage enemies from a distance. This keyblade is unlocked by completing Hercules' Olympus world, it allows Sora to use the 'Counter-Shield' transformation which turns his keyblade into an Olympic shield that both hurts enemies and blocks against their attacks. As you progress through the game different keyblades are unlocked which each have different stats that indicate strength, defense, and magic. 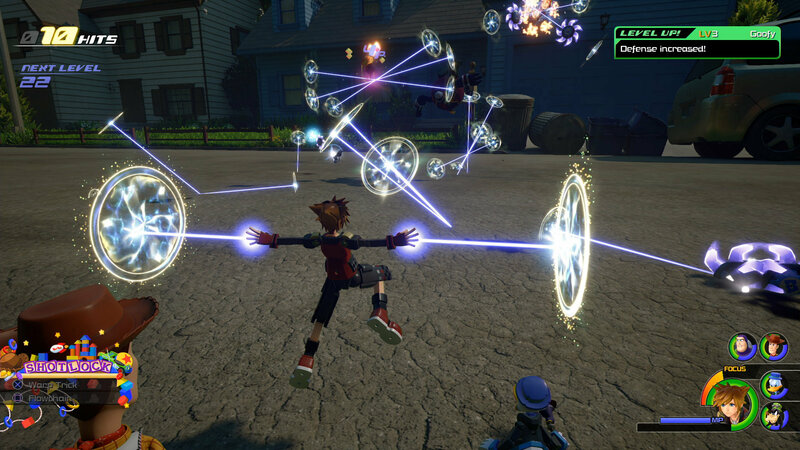 You will be able to assign up to 3 keyblades to Sora at a time in the 'Equipment' tab of your menu and you will be able to switch between them with the left and right D-Pad buttons while in combat.